The UK should abandon its current drugs policy because the war on drugs is not being won, Nick Clegg has said. Speaking on a visit to Colombia, the deputy prime minister said different approaches were needed although he did not back full legalisation. The Lib Dem leader said his party would publish a report on an alternative strategy later this year. The Home Office said there was no need to review Britain's drug laws, pointing out that illegal drug use is falling. BBC home editor Mark Easton said Mr Clegg had long argued that current UK drugs policy is not working. But he said Mr Clegg was frustrated by the Conservatives' refusal to set up a Royal Commission on the issue and had asked the current drugs minister, Lib Dem Norman Baker, to complete an international review. Speaking after meeting former guerrilla fighters and victims of what he called the "terrible conflict" in Colombia, he said the war on drugs had cost tens of thousands of lives, destroyed communities and forced people to live in constant fear. 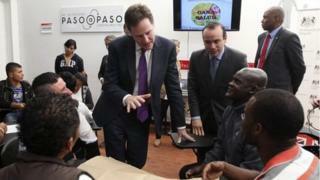 Mr Clegg said British politicians owed it to young people in the UK and countries like Colombia to look at different approaches - although he insisted he was not advocating full legalisation. Nevertheless, his party review will look at the impact of legalisation of marijuana in Uruguay and some US states, as well as the decriminalisation of all drugs in Portugal. In December 2012, Mr Clegg backed a Royal Commission on drugs, just days after PM David Cameron rejected the idea. A Royal Commission is a public inquiry, established by the head of state, into a defined subject and overseen by a commissioner who has quasi-judicial powers. Mr Clegg has said he wants to break "the conspiracy of silence" of politicians, while in government, refusing to consider alternatives to the war on drugs because it is "all too controversial". "If you are anti-drugs, you should be pro-reform," he has said.